Survival Armor’s Exclusive package deal. Offering HSG’s Duty line of TACOs® pouches for patrol units. 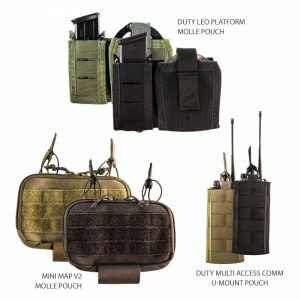 Includes: ONE-each Duty LEO Platform TACO® MOLLE Pouch, Duty Multi Access COMM TACO® U-Mount Pouch and the Mini MAP V2 MOLLE Pouch. Special Value Package only from Survival Armor. Choose the Mini Modular Admin Pouch to help get and keep your gear organized. This pouch will hold most handheld radios and issued personal communications devices. This double pouch will hold most pistol caliber magazines, small flashlights, pocket knives, multi-tools, handcuffs, field compasses, tins and more.